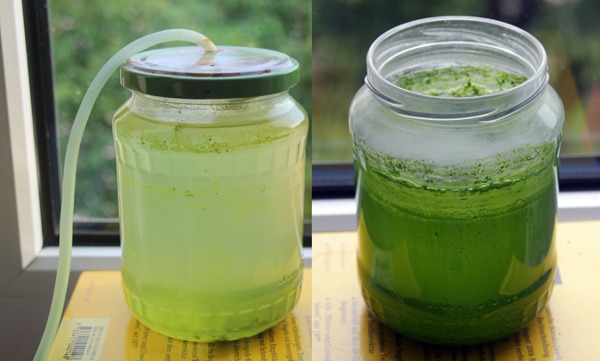 Fresh algae with air-pump (left) and after several days (right). The concentration of free-floating algae in pond water is sometimes quite low. Observation of pure pond water therefore does not always result in interesting microscopy. It is, however, possible to increase the concentrations of the algae by adding a small amount of fertilizer to the water sample. Instead of adding the fertilizer directly to the pond water, I used some clean tap water. I scratched off some algae and inoculated the water. I also added one drop of liquid inorganic fertilizer, the one which is used to fertilize garden flowers. Organic fertilizer (such as Guano fertilizer) might promote the growth of bacteria and I was therefore reluctant to use it. The first try was not successful, probably because I added too much fertilizer. 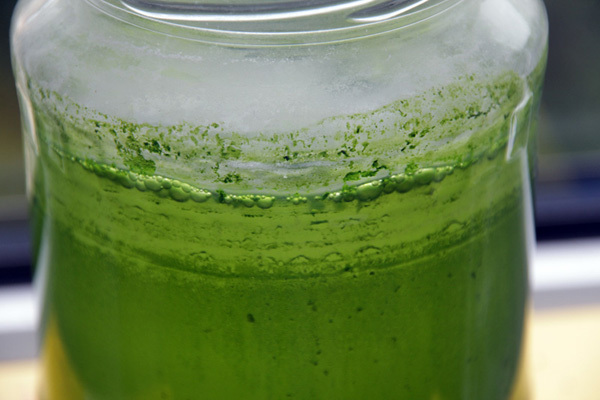 The water formed a white precipitate which accumulated on the bottom of the jar, but green algae could not be observed. I repeated the experiment adding only a single drop for about 500ml of water and was much more successful. I also supplied the jar with air, using and aquarium air pump to ensure sufficient carbon dioxide supply, but it also worked without air supply. I placed the jar into direct sunlight to promote photosynthesis. Evaporated water was replaced. After about 1-2 weeks the water turned increasingly green and biofilms started to form on the glass surfaces. Bubbles (possibly oxygen) also started to appear on the surface of the water. 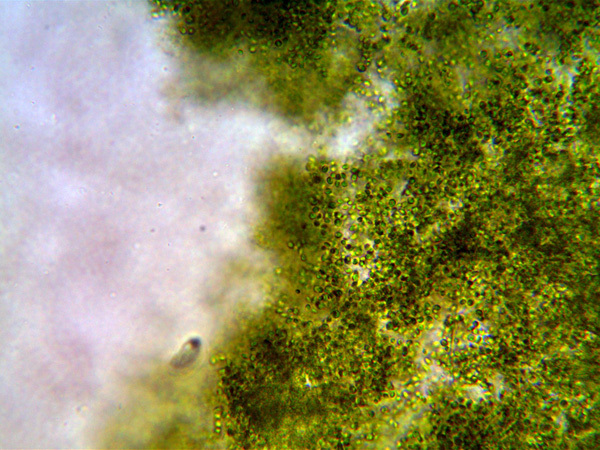 I found mostly single-celled algae and some ciliates. It would now be interesting to observe how a change in parameters (different types of fertilizer, lighting conditions, and water types) would promote the growth of different organisms. Bubbles of oxygen formed by photosynthesis. 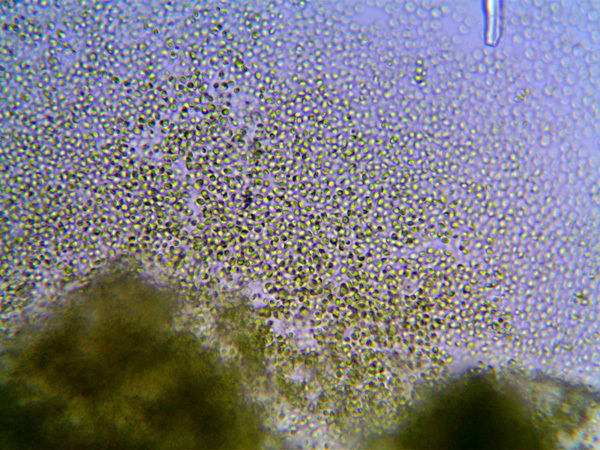 A biofilm of diatoms and other algae formed on the surface of the glass. 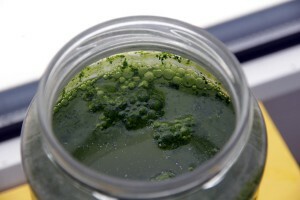 Hi, I need to grow algae for a project, and this is a fantastic article. I just need to ensure one thing though, when there is no CO2 pump, would the growth of the algae still be significant like it is on the right photo? Your help would be very helpful. keep the lid of the jar open, to allow for gas exchange, replace evaporated water from time to time. Do not forget to add a small amount of fertilizer. Too much is also a problem. Without minerals they can’t grow. Make sure that the water is not chlorinated. If the surface area exposed to the air is large enough, there should not be a problem, even without a pump. It depends also if there are any organisms in it, which produce CO2 or eat the algae. In short, there are many factors that influence growth, besides CO2. This is something to try out. Some folks put a bit of carbonated soda water into it, but this can then also be a CO2 shock, if too much.